iFun Engine has trial and commercial licenses available. Our pricing for the commercial license can be found on the iFun Engine website. You can use iFun Engine with a trial license for 1 week. If you need additional time to evaluate, you can get a trial license application page from the iFun Engine website to request a 6-month trial license. Be sure to check it out. If you have purchased a commercial license or a 6-month trial license, you will receive a license file called account.ilf. If you are currently working on a Linux server, you can make a directory called /etc/ifunfactory/ and copy the license file into this directory. If you are currently using a Windows PC and plan to run iFun Engine remotely on a Linux server, use a file copying program that supports SCP or SFTP, like WinSCP, FileZilla, or PSCP/PSFTP to copy the license file to the Linux server and copy it to /etc/ifunfactory/ as above. The following is an example of file copying using WinSCP. Connect to your Linux server with WinSCP. 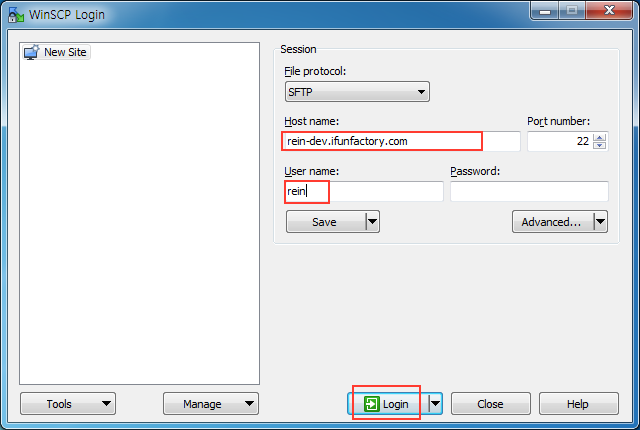 Choose SCP or SFTP as the file protocol and enter Host Name and User name, then click Login to connect to the server. The right panel in WinSCP shows the server-side directory. Choose the home directory here. (If the account name is ubuntu, the default is /home/ubuntu. 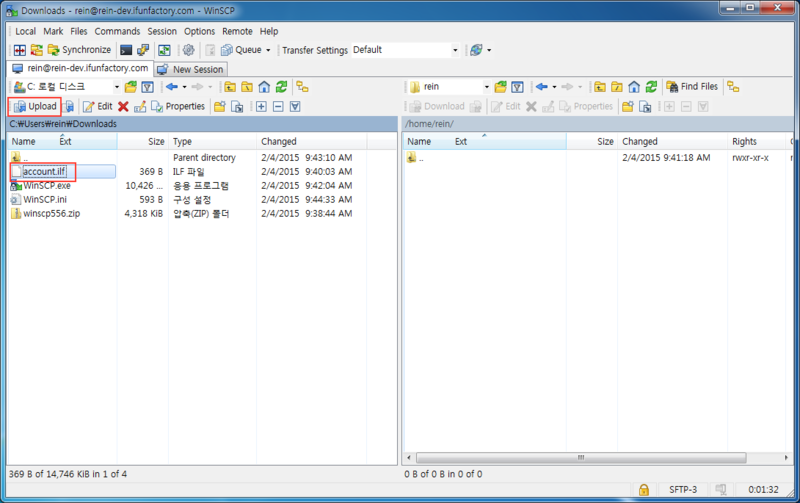 The left panel of WinSCP shows the Windows PC directory currently in use. Find account.ilf and click Upload. Download and run Putty. Enter the exact Host Name used above and click Enter. E0202 00:08:49.916679  5918 main.cc:97] You are using non-production license. iFun Engine stops after running for 30 minutes. In the trial version, the game server automatically shuts down after 30 minutes. If you have an official license, use the account.ilf file. # This is an evaluation license file for iFun Engine. # account.ilf instead of this. # This license expires by Wed Feb 11 13:43:59 KST 2015. If the server terminates as follows, it means there is no license file in the /etc/ifunfactory/ directory or the Linux user executing iFun Engine does not have permission to read this file. E0204 13:21:43.182627  5741 capability.cc:69] Failed to find valid account.ilf, which usually resides on /etc/ifunfactory/account.ilf. In such cases, upload account.ilf again and check that the user using iFun Engine has permission to read the file. ./example-local: line 51: 22481 Killed                  $FUNAPI_BIN_DIR/funapi_runner --main_program_name=$component_name --framework_manifest_path="$manifests" --main_enabled_components=$ComponentName --resource_root="/home/ubuntu/example-build/debug/resources" --max_log_size=10 --stop_logging_if_full_disk --log_root_dir="$FUNAPI_LOG_ROOT_DIR" --crashdump_root_dir="$FUNAPI_DUMP_ROOT_DIR" --alsologtostderr "$@"
Each account.ilf file has an expiry date. Once that date has passed, logs like account.ilf: not in valid datetime-range appear. If you are using a trial license, email iFun Engine support with the period you need. If you have a valid license, iFunFactory sends a new license file before the current one expires. ./example-local: line 51: 22494 Killed                  $FUNAPI_BIN_DIR/funapi_runner --main_program_name=$component_name --framework_manifest_path="$manifests" --main_enabled_components=$ComponentName --resource_root="/home/ubuntu/example-build/debug/resources" --max_log_size=10 --stop_logging_if_full_disk --log_root_dir="$FUNAPI_LOG_ROOT_DIR" --crashdump_root_dir="$FUNAPI_DUMP_ROOT_DIR" --alsologtostderr "$@"
If you get a message reading Error: Your system time is not correct as above, it means your server time is incorrect. In this case, it cannot communicate correctly with the licensing server.